While legend places (rightly or wrongly) the birth of the oral text of Alice's tale on July 4, 1862, it would take a few years for the story to reach an audience larger than the passengers on that small boat. 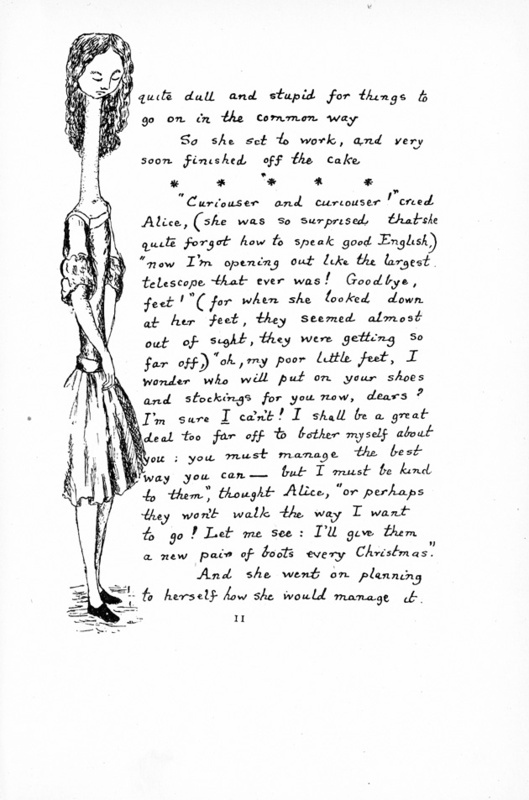 Several transformations accompanied the move into print: Alice's adventures took on a new title—and so did Charles Dodgson. The name Lewis Carroll was more than a pseudonym; it was its own performance, as Lloyd Humberstone suggests in his analysis of "Lewis Carroll" as a "pretendendly real individual" (487). The Alice manuscript, with the author's own drawings of Alice, would eventually be printed in 1886 in the edition pictured here. At age eighty-one, Alice Liddell received an honorary doctorate that Francine Prose calls a "doctorate in musedom" for her part in the shaping of Alice (1), although she would eventually be forced to sell the manuscript at auction and relinquish her control of the primary text's experience. The manuscript was eventually purchased by the New York Public Library in 1928, where 23,000 waited to see it in its first week of exhibition alone (Clark 149). This afterlife for the manuscript as artifact demonstrates how many readers wanted the experience of the "real" Alice, and if they couldn't have the "golden afternoon," they could at least see the penned words of Lewis Carroll for themselves. Such devotion is part of the cult of the original—the printed approximation, much less the scanned pixels here, cannot compete.